The TPCAST wireless adapter is an accessory developed for HTC VIVE. It enables VR experiences with no cables, offering 360 degree freedom of movement. This pro-level gaming Adaptor cuts off the wired connection for VR experiences and thus brings the VR technology to the next level, for a closer and more vivid interaction between the VR world and the player. The video resolution can reach up to 2k level (2160*1200) with a latency of less than 2ms. With up to 5 meters’ transmission range and 360 degree angle. Features • Easy to Install: The TPCAST adaptor replaces the HTC Vive cables following a straightforward and easy installation. • High Resolution: The transmission delivers up to 2k display resolution and provides an extraordinary virtual reality experience. • Immersive In-Game Experience: Getting rid of the HTC VIVE cables enables 360 degree of free movement. • Long Battery Life: Battery pack provides up to 5 hours of operation. • Extraordinary Comfort: The TPCAST wireless Receiver, attached to the HTC Vive is very light and small. • No Visual Distortion: The adaptor preserves the high video frame rate of 90Hz (90 frames per second). • Near Zero Latency: The adapter adds less than 2ms latency assuring a seamless VR experience. • Two-Way Interaction: Signals are transmitted back and forth between the PC Transmitter and Receiver. • Broad Signal Coverage: Signals can reach up to 5 meters with a 360 degree angle. • Video Format: HDMI 2.0. • Video Resolution: 2K (2160*1200). • Audio Format: 16 bit 44100Hz, 16bit 48000Hz. • Wireless Transmission Latency: < 2ms. • Signal Range: 5 meters, 360 degrees. • 1x USB Connection Line. • 1x HDMI Connection Line. Please Note: Images for illustration only. HTC Vive Headset not included, sold separately. TPCAST CE-01H Wireless Adapter for HTC VIVE Headset, Provides 360 Degree Freedom of Movement for Ultimate VR Immersion is rated 3.2 out of 5 by 6. Rated 5 out of 5 by professorX from Must have for Vive owners Lets start with Scans part in the transaction, as per usual Scan were flawless in price, product delivery and packaging - There is nothing I could think to change about them. Now for the product. 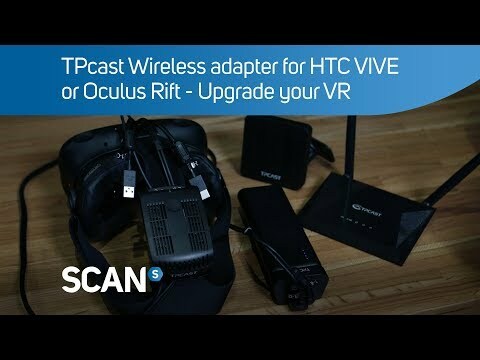 TPCast have excelled here with this Wireless kit for the Vive. The initial setup takes around 20 mins (including any double checking) and after that the system is very simple to use with no drop out in VR signal or any problems at all. I would change two things about the kit though, the first is the "battery" (actually a Power cell that can be used to charge mobiles/laptops etc) TPCast should have chosen to use the quick charge version instead of the cell that takes around 10-12 hours to fully charge - not a huge deal if charged over night admittedly and the second thing would be the inclusion of instructions of how to add the TPCast router to your existing network - the PC using the Vive has to connect to an included router and that router then connects to your home Broadband but the PC will not show up on your home network only the router does. Instructions can be found with a search but I still feel that comprehensive instructions should have been included. In short, if you are thinking of buying this kit I wholeheartedly recommend it especially if you buy it from Scan. Rated 4 out of 5 by LJBrooker from Excellent result, shonky execution Let's start by saying you don't want to be buying this product if you're just casually interested in VR. This is bleeding edge technology, and is fickle and difficult to set up. Also it's worth mentioning that the best performance it can provide is only unlocked by using custom third party firmware. This will enable the mic, as well as reduce start times, improve reliabililty, and tracking accuracy. With all that considered, and reviewing the product with those changes, it really is a wonderful bit of kit. I now need one extra step before starting SteamVR (running the USB host program that connects it to the PC), then I can 100% use SteamVR as per usual. It just works. I've not experienced a moment's issue with it. The only discernible difference between wired and wireless, is the TPcast introduces a very small strip of colour on the periphery of each eye. Blue on the left eye, green on the right. I suspect they anticipated people wouldn't see this, and just cropped the video transmission to save bandwidth. With the default Vive foam cover, you probably won't see it, but if you use something like a 6mm cover for better FOV, it'll creep in. And once you see it, you'll never unsee it, so you have to adjust the lens position to block it out, losing that extra FOV again. Aside from that small trade off, I have found losing the wires to 100% justify the cost of the TPcast, even if the hardware is clunky and inelegant, and with the default software, it at times felt like I was beta testing a product. Rated 1 out of 5 by sk19 from AWFUL. Ok when it works, but that's rare. As above when it works it's of course great not to have cables. But the truth is I have spent literally twice as much time firefighting errors and problems with it as I have using it. It is horribly unreliable. The instructions (even if you can decipher the poor English) are misleading. Got it to work but then it gives me heartache for no reason. Sometimes it means lots of random restarts of various parts of equipment in various random orders, but sometimes it just refuses to connect up and keep connection. I'll be returning the product in case it's faulty and will update what the replacement is like. My feeling though is that it's just poorly made and unreliable. Rated 4 out of 5 by grandmastermarclar from Great, but... No camera support - I'd actually forgotten about the camera. No microphone support - and with the receiver box on top of the HMD, wearing a gaming headset is nigh-on impossible. The deluxe audio strap actually exacerbates the problem. Oh, and ensure you have a spare Ethernet port, and cable too. The 1m Ethernet lead was too short for my liking. Rated 4 out of 5 by CptTangerine from Very good piece of kit but overpriced and with occasional glitches I have been eagerly awaiting the TPCast wireless adaptor for the Vive. Now it is here I am pretty impressed with it despite a few glitches. 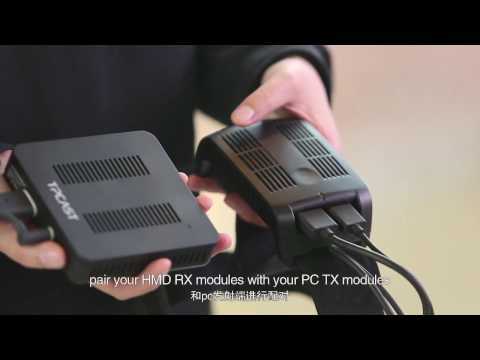 The TPCast requires a bit of set-up and it isn’t possible to easily switch between wireless and wired connection but the set-up isn’t that difficult if you follow the included instructions. I didn’t have any problems with the hardware. 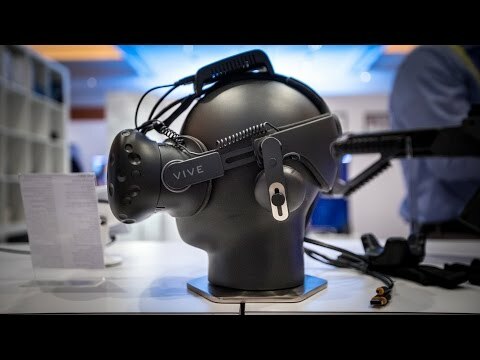 The items included in the box consist of a transmitter / receiver box that attaches to the head-strap of the Vive, a transmitter / receiver box that goes on the wall, a router, and a power connector with a big power-pack battery made by Anker. The router connects into the wired LAN connector in the back of your PC and has its own power cable (included), the transmitter box is to be positioned high up on the wall and uses the power cable and HDMI from the connector box that comes with the Vive, and the headset transmitter box connects to the headset itself via the connectors in the top-front of the headset. It is necessary to pop off the cover for the headset connectors, unplug all of the connectors in there, and replace them with the wires that come with the TPCast. I was a bit wary about this process but it’s very easy less a little fiddling. Once the set-up is all put together the power-pack connects to the power connector and the assembly sits in a little net bag supplied. There doesn’t appear to be an on / off switch, you just plug in or unplug the battery. The bag has a belt loop on it which can either sit on your own belt or can go on a webbing belt that is also supplied. I am using the webbing belt as it is just easier to put on and take off. From this point you need to download the software, run it, and put in the login and password for the power pack, it all connects up and then your run the VR software. That’s basically it. There have been a few issues with the TPCast but I will talk about those in a bit. Once it was all running I jumped straight into a single-player game of Onward to see how well it all worked. It’s pretty good. Not perfect. There was a bit of jerkiness occasionally but that might have been because I didn’t reboot my PC before firing it up, and that can cause these things. I got through an Operations match and killed all the AI bad guys so it’s pretty smooth and there was no latency affecting my aim. The freedom from wires is just brilliant! There are no more situations where I’m crouched down behind cover then jump up to fire only to be yanked back down again by the cable that I didn’t realise I was standing on. I do have to make sure that I stay in the middle of the blue circle though as it is easy to wander around the room. I could do without breaking the lightshade when I throw a grenade (again). When the TPCast is working well it really works well but, as I say, so far I have had a few glitches. The largest and most annoying glitch I have had so far was to do with wifi. As I said above, the kit comes with a router (which I understand deals with movement data) and this connects into the wired LAN port on your PC. Now, I connect my PC to my router by wifi as my router is on the other side of the room and I really don’t want to trail cables all around the place, and soon as I plugged in the TPCast router, off went the internet connection as my PC tried to connect through the wired router that is not connected to anything. I eventually fixed this problem by going into the Advanced Properties of the wireless connection in Network and Sharing, going into Change Adaptor Settings then Properties > Internet Protocol Version 4 > Properties > Advanced > unticked the Interface Metric box and put in a low number (greater than 1). I then did the same with the adaptor for the wired settings and gave it a higher number. That re-prioritised the connections and worked for me. It took a fair amount of Googling to find out how to do this though (hence why I am including it here). Other than that, I have had the TPCast crash on me a couple of times and refuse to acknowledge the Vive as a sound adaptor on one occasion. Both of these issues were fixed by rebooting everything. It also seems to be quite important that you run the TPCast software first then the Vive VR software. With a wired connection I always had to do it the other way around, starting up the VR software first, then turning on the Vive. Finally, an unconfirmed glitch is that there may be a little latency with the controllers. I occasionally find that when I am walking using the track-pads that when I move my thumb from the pad I keep moving in the same direction. It could be due to the TPCast or it could just be that my thumb was close enough to the pad to register, or it might just be that my controllers are getting on a bit. I’m not sure, but I will keep testing. All in all this is an excellent piece of technology. It takes a fair bit of setting up, adds quite a bit of clutter to your set-up, and may have a few glitches to iron out, but the benefit of being free from wires is just so great that I can put up with the problems as long as they remain minor. I was rather disappointed at the hike in price from the predicted one, but it’s high-end emergent technology and I guess that’s always going to be at a premium. Does this still come with a full-sized router? I have been reading that TPCAST were going to reduce the router that comes with this product down to a wifi dongle. Has this happened or is it still a full sized router that is going to need to be wired up? A full sized router came with my kit which was purchased within the last month or so.